The domino theory was a theory prominent from the 1950s to the 1980s, that speculated that if one state in a region came under the influence of communism, then the surrounding countries would follow in a domino effect. The domino theory was used by successive United States administrations during the Cold War to justify the need for American intervention around the world. (Wikipedia). The domino theory was largely used as a fear tactic in the US as well as in Australia, greatly justifying Australia’s joining the war in Vietnam in the late 1960s. But I want to focus on another type of Domino Effect, one that will greatly enhance your business and its future. In 1983, Lorne Whitehead wrote in the American Journal of Physics that he’d discovered that domino falls could not only topple many things, they could also topple bigger things. He described how a single domino is capable of bringing down another domino that is actually 50 percent larger. In their book, The One Thing, author Gary Keller (with Jay Parasan) explains how the domino theory can work for you. Most ambitious people are shooting for the moon but start by trying to hit it “first go”. They don’t realise that that there are 57 dominos in between them and the moon. If it is Mt Everest there are 31 in front of them. This is really a mindset thing. Most business people I have met were the ones that were happy to line up 3 dominos and push. Next time they went for 4…then 5. They worked to their plan and kept at it. The failures in business often went for 2o dominos and when they either didn’t start right or couldn’t get the 20 to fall, gave up. They might have been so close. If you want a bit of fun watch this video. A great domino fall. 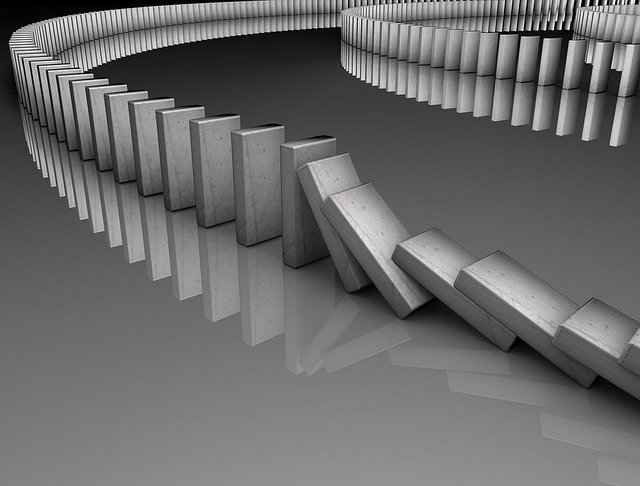 Get the Domino Effect working for you.